So I found out about this fair by surfing around online. It didn’t sound too big or anything but hey, a fair is a fair I guess and I’m trying to visit as many as I can this summer. I left for the fair at around 7pm, with full knowledge that a line of thunderstorms was bearing down on New Jersey. The drive was pretty straightforward, three highways that cut through the backwoods of Somerset and Morris counties. It was a surprisingly quick drive, probably only 20 minutes. The fair offered a $20 pay one price wristband which was laughable. 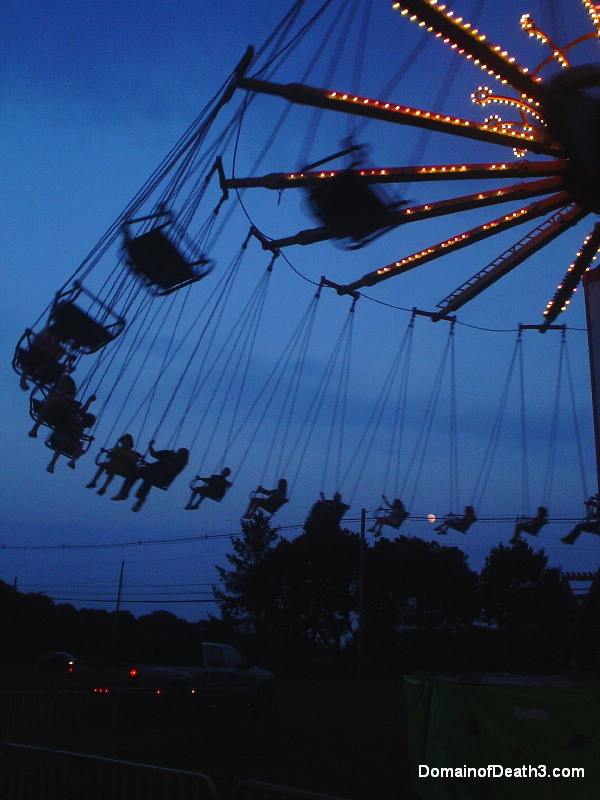 The Meadowlands Fair and Orange County Fair offered $14.99 wristbands on weekdays for the massive amount of rides that they had. Anyway, the Rave-Up was the ride at this fair. Before this year I hadn’t seen many Trabant rides at fairs for awhile, now I see the things all the time. This one was in great condition and spun pretty fast. The Yo-Yo on the other hand seemed like it was broken or something. It ran very slowly and didn’t tilt like all Yo-Yo’s do. 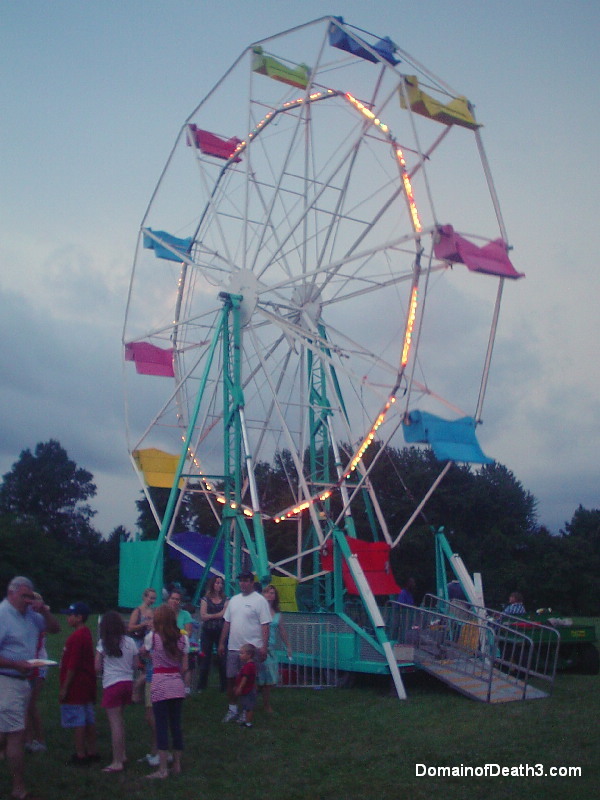 The Ferris Wheel was a standard portable wheel that must have been made by some lesser known company. It ran pretty slowly and didn’t have any lights on the sweeps. After getting some photos I checked out the 4-H stuff, which was the main part of this particular fair. They had this big fat rabbit in one cage; it must have been as big as a cat. Other cages had ducks and chickens while the glass sided tubs held different reptiles including this huge Albino Burmese python. Another tent had calves and donkeys and another had horses, complete with the smell of poo. One tent was dedicated to arts and crafts which contained…well arts and crafts. Some of the art was nice but some was put there out of pity for the creator. I mean barring that the kid who made it was probably like five years old. Still, I just don’t see how a bunch of scribbles with a half drawn stick figure is worthy of even ‘honorable mention.’ I’m sorry, I’m terrible. I contemplated getting a funnel cake but didn’t. I should have because…well I want one now. It’s worth mentioning that the storm was still in the area and closing in on the fair fast. Even when I was back at the rides, a ride op yelled to another “hey can we keep running? I see lightning and I don’t want to get a fine again!” Again? Occasionally a bolt would spit out of the dark grayish blue cloud. You can clearly see the storm clouds in many of my photos. 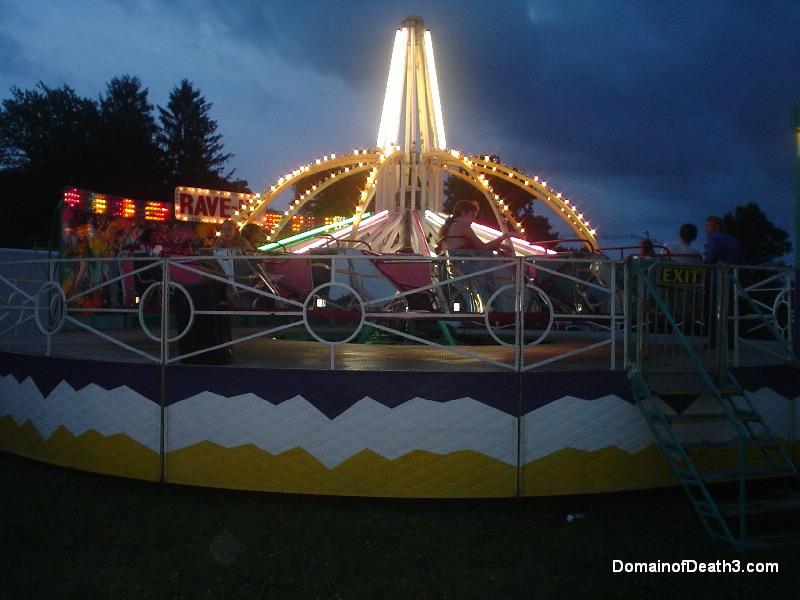 By the time I was about to leave, the storm was on the cusp of slamming into the fair. For me, it was now a mad dash to outrun the storm. I exited the lot and shot onto Route 206. I was traveling south on 206 so the storm was coming from my right. As I listened to the AM radio, I constantly heard the reception crack and go staticy as lightning discharged within the cloud. Occasionally I would see the landscape around me light up from the lightning. As I got on to I-78 east, I briefly got a clear view of the western horizon with lightning happening like every 2 seconds. Luckily I was going east, and fast. I eventually outran the storm, later finding out that it was indeed a severe warned thunderstorm. Later on it came into my area, but not nearly as bad. All in all I had a fun time on this little excursion, storm and all!